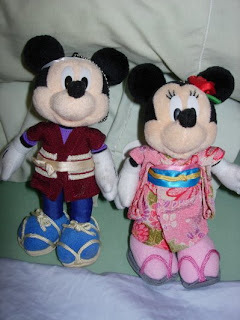 This is a pair of dolls from Tokyo Disneyland: Mickey Mouse and Minnie Mouse. Notice that they are in authentic, traditional Japanese garb. There's a lot of detail in these dolls. I got these from my friends, Eric and Barbara, who go to Tokyo Disneyland quite often (and bring back things for their friends to buy). These dolls have big safety pins on the back, so you can pin them onto your backpack, and have Mickey and Minnie hanging on!